Soil surveys are documents created by the USDA Natural Resources Conservation Service (NRCS) which records soil types with maps and describes soil characteristics. The last soil survey to be conducted in New Hanover County was in 1977. NHSWCD houses several copies of this survey that are free to the general public. Please contact us if you are interested in a hard copy of this survey. Soil survey information can also be obtained online. Please visit the NRCS website or the New Hanover County website for more information by clicking the links. Aerial photos are photos taken of the ground from an elevated position. The term usually refers to images in which the camera is not supported by a ground-based structure. Cameras may be hand held or mounted, and photographs may be taken by a photographer, triggered remotely or triggered automatically. 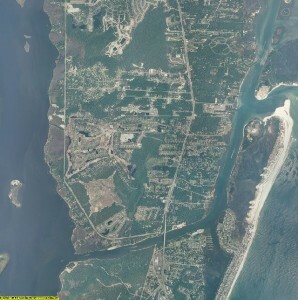 NHSWCD houses historical New Hanover County aerial photos from 1949, 1956 and 1966. Please contact us if you would like to set up an appointment to view these photos. All of these photos are also available online here.